Before you even consider who you are going to get to install your heat pump system you need to do a full assessment of the current energy performance of your house or office. You may also want to take a look how well your floors are insulated if you live in a much older house. A good way to find out how efficient you are is to undertake a Green Deal assessment. Air or Ground Heat Pump? The next thing you need to look at is whether you are going to go for an air or ground heat pump. As a rule, air heat pumps are easier to install but are slightly less efficient. The one thing you will need to decide is whether you have the external space to accommodate the main pump unit. A ground heat pump is more efficient but needs a site where the external pipes can be buried and involves a good deal of excavation work. If the workmen cannot access your site with their diggers and heavy machinery then you may want to look at an air source heat pump instead. You can search our database for a list of installers close to your post code here. We recommend that you get at least three quotes for the work to be done and do your research on the technology beforehand so that you can ask the right questions. One of the issues that you will need to consider is the Renewable Heat Incentive which is a government initiative that pays households for the energy they produce. To qualify for this you will need to ensure that your installer is a member of the Microgeneration Certification Scheme and that you have undertaken a Green Deal assessment. Air source heat pumps can be either mounted onto a wall or positioned on the ground. First of all you need to find a suitable place to situate the main unit. This ideally needs to be in a sheltered and safe place where it won’t be subjected to heavy rains and winds or be tampered with by anyone passing by. You also need a reasonable clearance around the unit (about 200mm for some wall mounted units, more for bigger, floor systems). The installation will involve an outdoor section and an indoor section, so make sure there is enough space inside as well. Once both units are fitted onto their mountings, refrigerant and drain hose pipes are connected and then insulated, both inside and out. The whole system can then be connected to your indoor heating system such as the boiler or radiators. Installing a ground source heat pump is far more complex than an air source one. You will, first of all, need the space to lay the pipes and you will have to provide access to heavy equipment such as diggers. 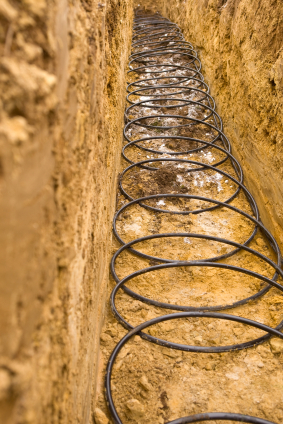 Installation of a ground source heat pump should not need planning permission despite the disruption caused by digging up the ground, as it is considered a permitted development. If you live in a listed building or in a conservation area then the rules will be different. Either way, it is always wise to check with your local council first to make sure you installation is possible. If you have enough garden space then an array of horizontal ground pipes that collect heat over a wide area is probably the better option. If you have a small area then it may be possible to dig down vertically by drilling a bore hole up to 100m deep. This will obviously depend on the nature of the ground under your property and may require a full survey which could add a significant cost to the build. The pipes from the outside array feed into the heat pump within the building which is then connected to the existing heating supply such as radiators as with an air source heat pump. As long as you have had your installation carried out by a company that is part of the Microgeneration Certification Scheme, you will qualify for the Renewable Heat Incentive that pays you for the energy you produce. You will also need to have carried out a Green Deal Assessment and your product must be included in the Ofgem list of acceptable technologies. Ofgem administer the scheme and they make the payments on a quarterly basis. You can find out how to apply here. Whilst there are a number of hoops to jump through to get the Renewable Heat Incentive it can help offset the initial cost of installing your heat pump by providing regular payments for the energy you produce.